Maria in the Moon is like one of those magic eye pictures popular in the 90s: It takes a while to see what you are looking at, but once you do, you’ll never see just a row of dots again. It’s a clumsy analogy and I’m certain that Louise Beech, the eminently gifted author of this dark tale, could conjure a far better one. I was attracted to this novel by its excellent reviews (many of them detailed) and I’d read the blurb so I sort of knew what I was getting and was excited by it. I also figured out the theme and where it was all heading at an early stage, but as Maria in the Moon is not a whodunit, for me at least, this did not spoil the journey. The premise of the book is that thirty-something Catherine Hope spends her time helping others to forget her own problems; if only she could remember what they are. Because Catherine cannot recall the year she was nine years old. Soon after volunteering at a Flood Crisis centre, she begins to experience broken sleep, night terrors and visions. The book is a slow reveal of what happened to her that year and it is hard-hitting stuff. The characterisation is brilliant – I felt I knew this woman; a misfit given to mood swings and self-sabotage, the reader feels keenly that Catherine is hanging on to sanity by her fingernails. Other characters provide light relief, like flatmate ‘fluffy’ Fern – femme fatale and rookie columnist for a national newspaper, the vacuous and petulant Celine, Catherine’s step sister, and kind, caring Christopher, mentor, colleague and potential love-interest at the crisis centre. Catherine’s cold and critical mother made my blood boil and her eternal grieving for her dead father made me weep. Louise Beech’s writing style reminded me of Kate Atkinson’s in that she evokes a tide of emotion without mawkishness or cliché, and her prose is modern and fluid. 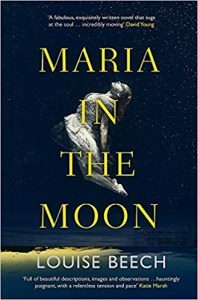 Maria in the Moon is moving and thought provoking throughout. It’s an excellent, if uncomfortable read, and I highly recommend it.